Pasta and beans simmered in herb-infused tomato sauce are the building blocks of this hearty Italian soup, Pasta e Fagioli. When you’re cooking for a crowd, in search of a budget-friendly meal, or craving a simple dish to please everyone at your family’s table, this is the soup for you. 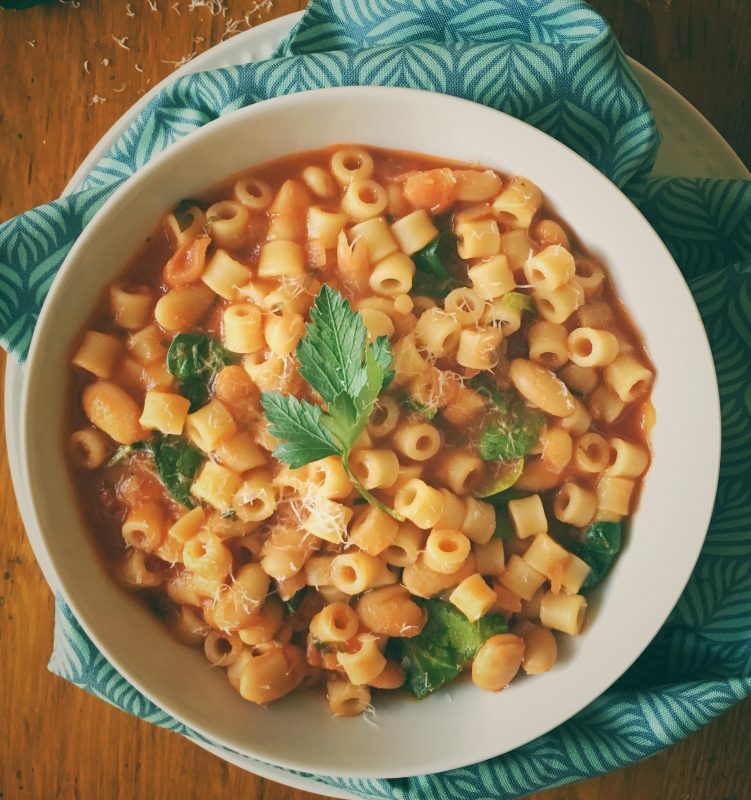 When I was growing up in New York, my mom made plenty of Italian-inspired dishes — things like lasagna and chicken Parmesan — but it wasn’t until college when I visited my roommate’s family in Connecticut that I tried pasta e fagioli. Until recently, I had never made this dish myself (I’m not sure why I waited so long), but I always remembered it. I think it was the aroma and flavor of the fresh rosemary and garlic that had me hooked the second that spoon hit my lips. Click the PLAY button above to listen to my podcast episode with Alex on Modern Italian Cooking. 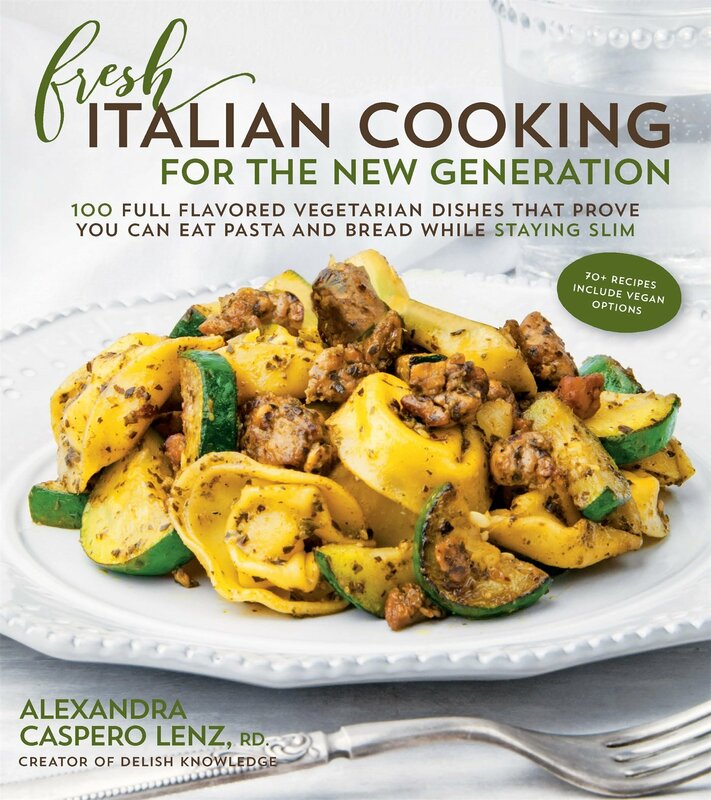 When fellow dietitian, Alex Caspero, sent me her new cookbook, Fresh Italian Cooking for the New Generation, I poured through its pages, added about a dozen sticky notes, and ultimately gravitated to her version of pasta e fagioli. Alex makes it with ditalini pasta, cannellini beans, tomato sauce, rosemary, parsley, garlic, and spinach. It was the familiar ingredients that appealed to me, because I wanted to replicate the dish that I ate in college, but the dietitian in me also appreciated the addition of spinach. The more veggies the better as far as I’m concerned. Alex joined me this week on Episode 2 of Liz’s Healthy Table. You can listen to the interview, read the show notes, and get Alex’s recipe for Roasted Vegetable Ziti on my Podcast page. This recipe comes courtesy of Alex Caspero, author of Fresh Italian Cooking for the New Generation (Page Street Publishing Co). She says that this dish reminds her of boisterous family dinners ... and her mom! In a large saucepan, heat the olive oil over medium heat. Add the copped onion and a pinch each of sat, pepper, and crushed red pepper flakes. Sauté for about 5 minutes, until onion is translucent and soft. Add in the garlic and rosemary and cook for 30 seconds, taking care not to burn the herbs or garlic. Add the tomato sauce, parsley, and beans. Reduce heat to low and simmer for 1 hour. Bring a large pot of salted water to boil over high heat. Add the ditalini pasta and cook until al dente, reserving 3 cups pasta water. Before serving, remove the rosemary stems, add the cooked pasta to the tomato and bean sauce, and thin with the reserved pasta water. You will probably not use all 3 cups. Add ½ cup at a time, stir, and add more if need be. Thin the tomato sauce until it resembles a soup broth. Stir in the spinach until wilted. This tastes even better the next day. If you have leftovers, add a little more pasta water before refrigerating. 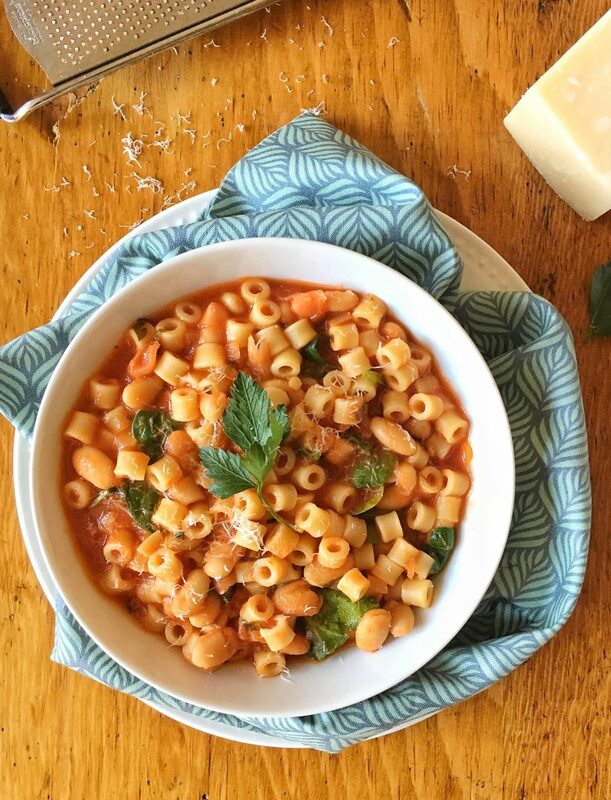 Did you grow up eating pasta e fagioli? How did you family make it? I’d love to hear about your version. 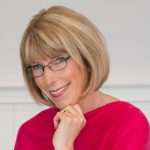 Don’t forget to tune in to Liz’s Healthy Table and hear my interview with Alex Caspero, RD. Enter the giveaway by posting a comment. So glad to have Liz in my podcast line-up once again! Thanks Alex for your great ideas for bringing pasta back to my dinner table. Looking forward to trying the Fresh Corn & Zucchini Gnocchi! Liz, so glad to see you back on a podcast. I was missing your podcasts! My kids favorite Italian recipe is my homemade pasta sauce, which we use for pizza or pasta. I can’t wait to try this recipe, and this cookbook sounds awesome to an Italian girl! I’m happy to be back! And I’m thrilled you joined the Posse. Two shows that are in the works are Picky Eaters and Becoming a Vegetarian. Be on the lookout on the Posse page, b/c I’ll be asking you guys to weigh in on each show. Appreciate your support! Hi Liz! It’s great to hear your voice again on the podcasts and I loved your first one with your husband as your guest. My family loves anything that has red sauce as a major component and the above recipe looks delicious. I would love to add some new “red sauce” recipes into our mix, especially ones that are more plant based. I’m looking forward to your next podcast! You family will love the recipe. Hearty, flavorful, fun to eat with some garlic bread and a salad on the side! Great to be back in the podcast game!! What a great concept and lovely sounding book! So happy to have the podcast back. I am looking forward to making more of your delicious and healthy recipes! If there are tomatoes, pasta and various veggies I am a player. Me too. I can’t wait for summer tomatoes. Heck, I can’t wait for summer! Yes. Italian Wedding Soup is so comforting. My sister’s mother-in-law makes it often and I always look forward to it!! Happy to hear you again! I listened to your first 2 podcasts and they were great! I am an R. N. from Boston, now living in Florida and I love to cook for my family. Our favorite italian recipe is chicken piccata with lots of lemon, side of whole grain angel hair and broccoli. My 7 and 9 yr. old gobble it up. We are a pasta loving household so this cookbook sounds perfect! Yum. I love chicken piccata too. Tonight, we roasted broccoli florets. My new favorite way to eat them. Thanks for tuning in to the podcast. It’s great to be back! This is one of my favorite soups to make. I also love lasagna Bolognese. Can you believe it took me so long to make this dish? I will make it again for sure. So delicious! I love meals that are easy & nutritious! This fits the bill & looks so tasty! That’s what I love too!! My family does not care for eggplant . When my CSA offers eggplant, I invite a friend a friend and my uncle over for dinner . I use fresh spinach , a homemade sauce and I slice the eggplsnt and salt it to get the water out . I make a homemade sauce from canned tomatoes , fresh basil , and other spices . . Then , I coat it with shredded mozzarella and cake until goden . I have never made that before. Must try it! This looks awesome!!! I would love to win it! Love love love your new website!! Looking forward to future shows in the new podcast. The cookbook looks fantastic. Would lyou e to win a copy! Always looking for meatless and healthier food options for my family! Cookbook looks amazing! My daughter and I love pizza and spaghetti, but I am adventurous and enjoy trying new things. This soup looks great! I can’t wait to try it. I really like Italian food and hope to learn a lot through the blog. Thanks! You are most welcome. Good luck! Our favorite Italian meal is most definately pizza – both delivered and homemade. Great site & welcome back! My son’s favorite pasta is good ole spaghetti with marinara. Us adults like spaghetti or bucatini drizzled with olive oil, & topped with fresh basil, grated garlic, chili flakes, & parmigiana. Thank you for writing and publishing a plant-based Italian cookbook. It’s so rare to find one that caters to those specific dietary restrictions. Whether it’s for health or ethical reasons, we need more options like this. I hope to win the book, but if I don’t, I will definitely plan on checking it out. BTW, this particular recipe looks good, but I can’t wait to see the rest. Cheers! Thanks Jimmy. So glad you stopped by. This book is a winner for sure. I love it. We love all Italian foods and just discovering you and joining tonight I’d love to try the cookbook if lucky to win. Already made three copies to get ingredients and make! 😄 Thanks so much!! The only Italian food we ate when I was growing up was the spaghetti my Dad made. It was nothing like real Italian! This recipe looks delicious. I love cooking pasta dishes, I’ll try this one! The soup looks wonderful! I can’t wait to try it but a little hot in my area for soup right now. But will definitely add it to my list when Fall rolls around. It’s still so cold here in New England. Brrrrrr…. Enjoy it in the fall. Our family loves cannillini beans and this was a winner for our family dinner! Thanks for sharing! This recipe looks amazing! I ate this as a child and have very fond memories of it! Would love to have your cookbook! I have those same fond memories! Our family loves lasagna and we have it at Christmas every year! My son loves many of your recipes. I can’t wait to make some new ones! I remember as a child, having sauce cooking on the stove and loaf of Italian Bread there to taste the sauce. The house smelled so good and the sauce was thick and delicious. I still make my mother’s sauce today. The soup recipe looks amazing…will add it to my personal recipes. Tell me more about the sauce? Just tomatoes or was it like my friend’s “sauce” which also included meatballs? We make “Godfather Spaghetti”. It is the recipe recited in the movie, the Godfather, and is actually the producer’s family recipe. “First you fry up some garlic… Then you shove in your meatballs…” I know it doesn’t sound healthy based on that quote, but we use grass-fed beef from the farmer’s market, and TONS of fresh tomatoes. It is such a treat! Great recipes and ideas! Our favorite Italian recipe is an old family recipe for lasagna. We love chicken marsala and chicken piccata! The pasta e fagiola recipe looks delicious. I love pasta bolognais in everyday Italian by Giada. Full of veggies and protein and flavor! Italian food is favorite so and this book looks perfect..
My family loves Italian cooking! We enjoy a simple tomato marinara made with tomatoes, basil, olive oil, garlic, and a little wine. We serve this over fresh pasta or ravioli. I would love to win this book to find some more ideas for family dinners! My family loves Italian food, especially bruschetta chicken. This cookbook looks great and I would love to win it so that I can make more yummy recipes! Loved Meal Makeover Moms and all the great information I gleaned. I’m so happy you’re back and continuing to generously educate. I would love to win the cookbook! It’s fun to be back with a new website! Thanks for sticking with MMM and now LHT for so many years!! Hi Liz! I am so glad to see this beautiful new website. I love your healthy yummy meals. I am so glad you are back to podcasting. I would love learn about some great pasta recipes. Pasta and bread….while staying slim…i’m in! Thanks for devoting a show to making pasta enjoyable to eat again. I loved Alex’s explanation that if you are eating a mostly plant-based meal, it isn’t going to kill you to eat some good pasta! I”m making this recipe for mother’s day, and I’m going to take the advice to prepare it today so it will be better tomorrow. Janis, I can’t wait to hear what you thought of Alex’s recipe! And I agree that she provided a great perspective on Italian food and pasta! Thanks for sharing these recipes and for the chance to win a book! Our family would love the pasta fagioli recipe you posted because we love all things Italian! Our favorite right now is a pesto chicken dish. So fresh! Congrats on your new gig Liz. I remember my internship with you and Janice fondly and make a lot from your cookbooks on the reg. Thanks Mary! And thanks for stopping by!! Your cookbook sounds amazing! I love Italian food. My non biological father is Calabrese and makes the best homemade pasta. I love his raviolis and farfalle. He’s made them with semolina flour as well as whole wheat flour. My non-biological mother makes terrific Italian sauces despite the fact that she’s a hundred percent German. I love her marinara it’s spectacular! Our favorite is lasagna. And I’d love to win cause trying recipes from new cookbooks is one of my favorite things to do and this one sounds awesome! Our favorite is lasagna at home. Hope to be lucky and win a new cookbook and have fun trying new recipes! I love Italian food and my dream when I was younger was to marry an Italian, and my dream came true! Now we have two little ones and I have started making different kinds of tomato sauce and meatballs from scratch! I would love this cookbook but cause I am always looking for Jew things to try. I love how your dream came true! Thanks for sharing your story. Italian is my family’s favorite cuisine and we all happen to be vegetarian! My kids love cooking with me and they love looking at the pictures in cookbooks too. Our family LOVES Pasta e Fagioli! (as a matter of fact, it is one of the few meatless meals that I can get away with! Matt often asks that I add sausage, but the boys remind him that adding meat would change the nature of the dish!) I love that it is quick to whip up and that I almost always have all of the ingredients needed! I would love to win the book because my husband and I just made a goal to incorporate more vegetarian meals into the weekly rotation and I loved listening to the episode featuring Alex. Love all foods (and wines) from Italy and traveling in Italy. Cookbook would help me cook more Italian foods myself. My 14 year old is vegetarian and I’ve been avoiding pasta for weight control reasons. It would be great to find recipes to please everyone! Between your vegetarian and your desire to find healthy pasta recipes, you sure would love this book! We don’t have a favorite recipe yet but I’m sure that we will find one will the help of your lovely book. The pasta e fagioli was a huge hit with my hungry teens. They loved the spicy red pepper and the flavor of the sauce. Something different from the usual basil and oregano. I added a little rosemary plant to my herb garden.. (Cheaper than herbs from the grocery store!) I served it with grilled chicken and a tossed salad. My daughter and I were fine with the pasta and salad but the boys and Dad needed the chicken too. We are on a LHT new recipe roll this week! Love having more time to try new recipes and read food blogs over the summer. HI Carolyn: that makes me very happy! Glad you’re on an LHT roll (whole wheat, of course)! I’m excited because I just found your podcast! We love pasta at our house, but need some ways to mix it up and also go meatless a little more. I’m looking forward to trying the two recipes from this podcast, and maybe checking out her cookbook. Thanks! I’m thrilled you found my podcast. How did you hear about it? So glad you’re now a listener! !